The selection committee for the Herb Kohl Educational Foundation Scholarship, Fellowship, and Leadership Program announced Tuesday, March 20 the recipients of the 2018 Herb Kohl Foundation awards for students, teachers, and principals. Awards in the amount of $6,000 are being made to 100 teachers, 16 principals, and their schools, and $10,000 scholarships will be given to 191 graduating high school students. 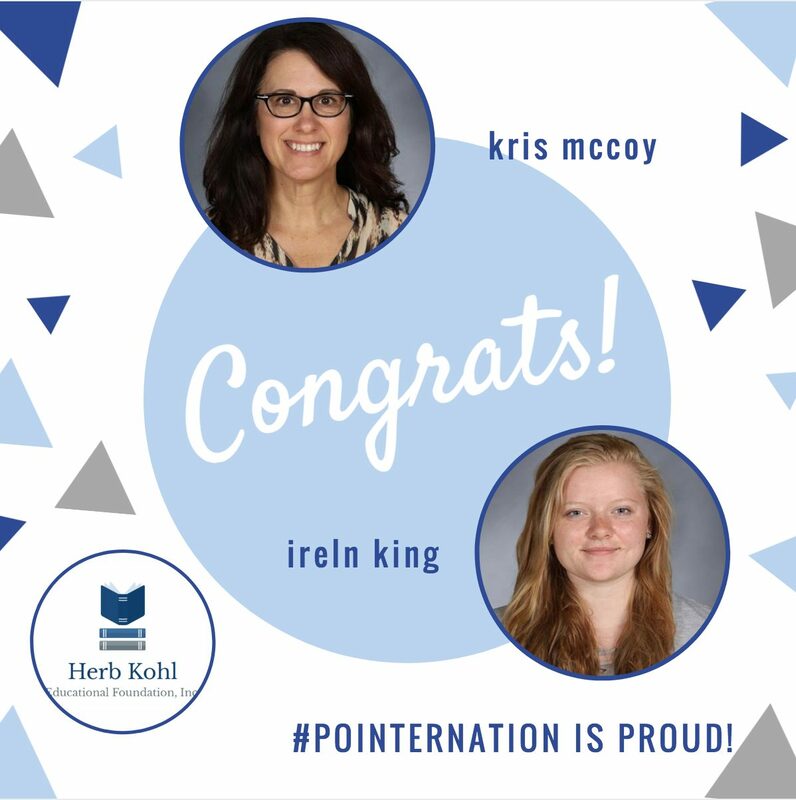 The Mineral Point Unified School District is proud to report that Kris McCoy, Middle/High School Instructional Media Specialist and Middle School Reading Teacher, has been named a winner of the Teacher Fellowship, and Mineral Point High School Senior Ireln King has been named an Initiative Scholar. Fellowship recipients are educators who have been chosen for their superior ability to inspire a love of learning in their students, their ability to motivate others, and their leadership and service within and outside the classroom. Initiative Scholarship recipients, chosen by their schools, have demonstrated exceptional initiative in the classroom and have shown strong promise for succeeding in college and beyond, but have not yet received other academic-based scholarships. “Herb Kohl, through his philanthropy on behalf of our educators and students, has provided opportunity and access to a better future for countless Wisconsinites,” said State Superintendent Tony Evers. Excellence Scholarship, Fellowship and Leadership Award recipients are selected by a statewide committee composed of civic leaders, representatives of education-related associations, and the program’s co-sponsors: the Wisconsin Newspaper Association Foundation, Wisconsin Department of Public Instruction, Wisconsin Council of Religious and Independent Schools (WCRIS), regional Cooperative Educational Service Agencies (CESA), the Association of Wisconsin School Administrators, and the Wisconsin Parents Association. The Kohl Foundation Scholarship and Fellowship program was established by Herb Kohl, philanthropist and businessman, in 1990. To date the foundation has awarded $14.5 million to Wisconsin educators, principals, students, and schools. “Education is the key to the future of Wisconsin and our nation. I am very proud of the accomplishments of these students, teachers, and principals and look forward to the great contributions they will make in the future,” Kohl said. The duo will be honored at a ceremony at Monona Grove High School Saturday, April 14. Student Excellence: Marsha Bingham, 1991; Christopher Marr, 2004. Student Initiative: Sarah Janke, 2002; Cory Sokol, 2005; Sierra Gunderson, 2011. Teacher Fellowship: Bonnie Laverty, 1997; Matt Nevers, 2017.